The Jean Paul Gaultier Autumn/Winter 2014-2015 Show, entitled « Rosbifs in Space / Les Rosbifs dans l’espace » («The Brits in Space »), paid tribute to the United Kingdom. Other United Kingdom-influenced collections : Aquascutum by Joanna Sykes Autumn/Winter 2011-2012 (this show was titled « English Icons »), Dior by Gianfranco Ferré Couture Autumn/Winter 1989-1990 (this collection was dubbed « Ascot-Cecil Beaton »), John Galliano Spring/Summer 2009 (the references of this show were James Gillray and Queen Elizabeth The Queen Mother), N° 21 by Alessandro Dell’Acqua Autumn/Winter 2012-2013 (this collection was influenced by Queen Elizabeth of England in her garden). To read about other United Kingdom-inspired collections, search for the « Great Britain » post that I have published on February 22, 2013. To read about other collections with the Union Jack, search for the « Union Jack » post that I have published on March 18, 2013. 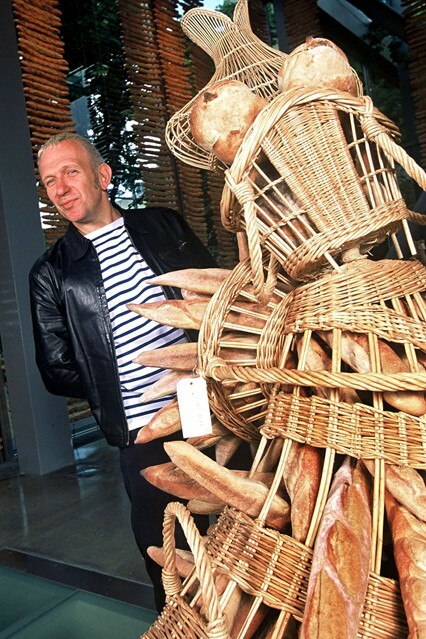 For the exhibition « Pain Couture by Jean Paul Gaultier », presented at the Fondation Cartier pour l’art contemporain, in Paris, from June 6 until October 10, 2004, the French couturier recreated his work in bread. The 36th look, named « Les Visiteurs du Soir », of the Jean Paul Gaultier Couture Autumn/Winter 2009-2010 Show, titled « Actresses / Les Actrices » (or « Cinema / Cinéma »), was a tribute to Marcel Carné’s « The Devil’s Envoys / Les Visiteurs du Soir ». Another « The Devil’s Envoys »-inspired collection : Dior by John Galliano Couture Autumn/Winter 2006-2007 (in part). The triangular shapes of the Jean Paul Gaultier Couture Spring/Summer 2009 Show paid homage to Klaus Nomi. Another Klaus Nomi-inspired collection : Givenchy by Riccardo Tisci Couture Spring/Summer 2008 (the mood board of this show, which was dedicated to ballet, featured images of Klaus Nomi). Jean Paul Gaultier’s final women’s ready-to-wear collection, for Spring/Summer 2015, titled « Miss Jean Paul Gaultier », was a tribute to the Miss France beauty pageant. This outfit, named « Teotihuacan », from Jean Paul Gaultier’s « Mexico » Couture Spring/Summer 2010 Show, paid tribute to the eponymous pre-Columbian Mesoamerican city, in the Valley of Mexico. The Jean Paul Gaultier Couture Spring/Summer 2011 Show, titled « Punk Cancan », paid homage to French cancan and British punk bands, such as The Clash. Other The Clash-inspired collections : Kelly Wearstler Pre-Fall 2012 (old videos of The Clash were among the influences of this presentation), Luella Autumn/Winter 2000-2001 (this show was titled « Daddy, who were The Clash ?»), Phi Spring/Summer 2008 (this show paid tribute to the « insouciant yet elegant » look of The Clash). Moreover, in 2010, to launch The Rodnik Band for OVS industry capsule collection, Philip Colbert wrote the song « God Dress the Queen ! », which was based on The Clash’s « London Calling ».